For at least two decades, nuclear engineers have been talking about new reactor designs, but few have progressed to become important components of the industry. Naturally, as with any new technology, there are always boosters and their enthusiasm should be treated with caution, but there is definitely potential for advances that could mean a surge in nuclear power. One aspect that needs greater attention is the benefit of smaller reactors, which greatly reduce risk on the part of investors. Some new designs are more incrementally advanced, such as the European Pressurized Reactor (EPR) developed by Areva and EDF in France, with units under construction in Finland, France and China (The proposed British unit at Hinkley Point is on hold). They operate more efficiently than existing reactors and have much greater safety and security measures, making it a third-generation reactor. The biggest drawback of some designs remains the size and length of construction as well as the design novelty. The Pebble Bed Modular Reactor, which has been under consideration for at least two decades, is a fourth-generation reactor with a design that appears to be very safe and easy to operate, but the radically different design has apparently contributed to slow adoption. South Africa cancelled its planned reactor due to lack of finance and demand, and only China is now planning construction of a full-scale reactor. With other reactor types like the EPR, the risk is in the large size, meaning longer construction times and thus, more demand risk. Before the 1980s, there was a sense in the U.S. utility industry that demand growth was inexorable, that nothing could reduce it and utilities merely needed to arrange for construction of new capacity. The figure below shows that annual demand growth from 1955 to 1970 was roughly 7% per year, which was a reason why utility stocks were considered especially low-risk. You built plants, sold the electricity, paid your dividends. But slower economic growth and higher electricity prices caused a sea change in the industry, with demand growth not only dropping but becoming much less certain. 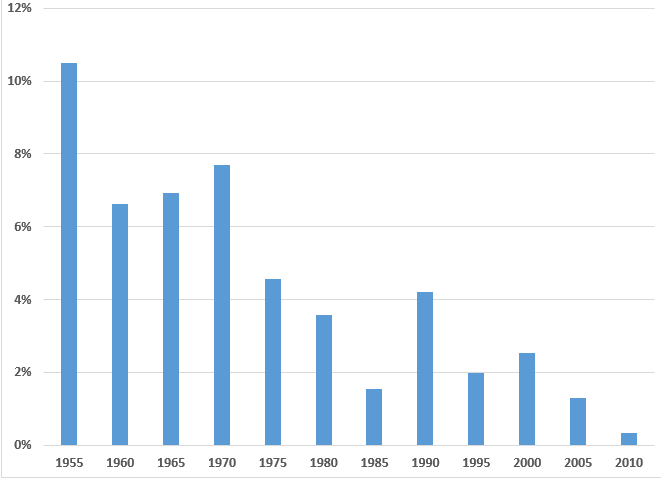 Long construction times for plants in the U.S. that were started in the 1970s have generally been blamed on political and legal opposition, and with some justification. But even in the case of Hinkley Point in Britain, construction is expected to take 8-10 years by the builders. Already, many worry that the price being offered for the electricity to be produced in 2025 (about 12 cents per kwh) would be well above recent market prices. Indeed, one large buyer claimed to have purchased nuclear power from France at half the price Hinkley Point has been offered. Price risk is very serious and not eliminated by government guarantees, as the European solar industry has discovered. Demand risk is always present, partly because of uncertainty about long-term economic growth, partly because prices will have an uncertain effect on demand over the next decade, and partly because policies towards renewable energy cannot be predicted over that time. An appropriate reckoning of these risks by investors should lead to fairly high borrowing costs.